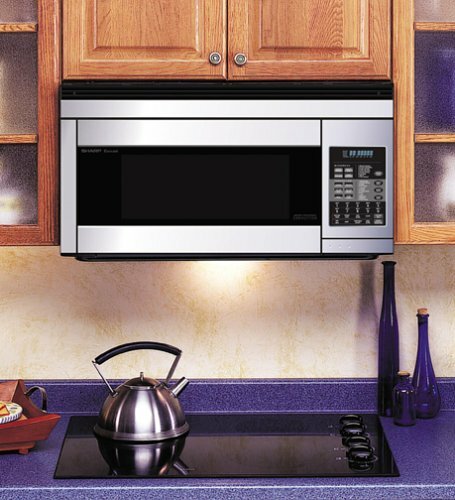 An over the range microwave is a great purchase if you’re looking to save some counter space in the kitchen. It can be tucked away above your existing range, and it is easy to find a model that will match your current range in design and color. Over the range microwaves replace range hoods – they have features that will evacuate food odors, smoke, and steam away from your range oven. Some models come with convection cooking capabilities, so you can maximize your cooking space and really get multitasking in the kitchen. In this guide, we will cover some of the best OTR microwaves, including their type, size and wattage in our comparisons and reviews. The design of this Whirlpool model is sleek and simple in all black, with a very user-friendly control panel featuring buttons dedicated to popcorn, potato, pizza, reheating, soften/melt and various cooking time and power options – the food item codes used to power the oven are listed inside the door. Unlike some other models, the turntable can be stopped, giving you more versatility in your choice and size of cookware. This fact, combined with a generously sized interior, gives you ample cooking space. For safety, there is the control lock feature, which prevents unintentional cooking. Operation of both the microwave itself and the fan is nice and quiet, and the venting fan works extremely well. One design feature that could be improved in this model is the lack of a grill over the exhaust vents on the top of the microwave – if you accidentally drop small objects from the overhead cabinets, they could fall into the large exhaust holes. 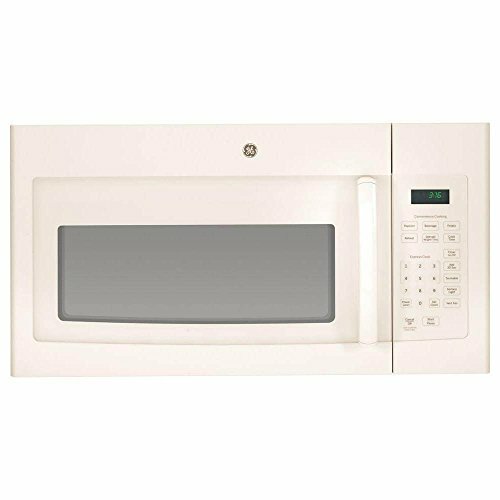 This is a basic microwave without any excess bells or whistles but has everything you need wrapped up into a simple to operate, roomy design. For those on a budget looking for a straightforward, reliable microwave, this is a great option. Although the design is rather sleek, with stainless steel trimmings and a black display panel, it rather has a retro feel to it. The control panel is rather ‘busy,’ with all the cook settings for both convection and microwave oven written in white text. The Sharp R1874T 850W microwave trades power and space for a convection fan. Convection cooking is awesome, especially during warmer months, because you can literally cook food in it like an oven without heating your entire house. This microwave is smaller than the one in our previous review in two areas – the wattage and size. It only has 1.1 cubic feet of space. When used as a regular microwave, it uses less wattage, which may mean longer cook times by about 20%. While the convection modes are a major feature, the microwave requires the turntable to be engaged while it’s being used. It’s already a bit on the small side, so this places some strict limits on the dishes you can use. Rectangular dishes are probably not a good idea since the corners may rub against the walls as it turns. Most microwaves allow you to adjust both the power setting and the time while they’re being used. This one doesn’t. You’ll have to stop cooking entirely to make any changes and be mindful of your initial settings or accept that you’ll have to start again from scratch. For a small convection microwave, the Sharp R1874T may be a great pick for anyone who will use the convection mode regularly. If you don’t plan to bake with your microwave, or need to use large baking dishes, this unit may not be for you. Although the design is nothing to write home about, it does have a modern feel, with smooth stainless steel trimming and handle, and black control panel. The interior is large, so you’ll be able to squeeze in those larger cooking bowls and dishes. Both the interior light and range light are nice and powerful, so no squinting to make out your cooking in a dark kitchen. The stainless steel interior is easy to keep clean and the control panel lettering easy to decipher. 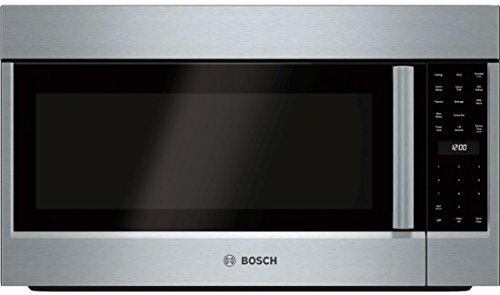 Although the Bosch HMV8053U does have convection capabilities, unfortunately, they may fall short of your expectations – cooking power feels weak and cooking times are longer than you would expect. The vent fan itself is also rather weak and noisy. If you’re looking for a user-friendly interface, you may be frustrated with this model. Unlike many microwaves which merely require one-button controls for settings, this one is rather complex and not intuitive at all – you must refer to a cooking guide and input multiple different numbers – it takes a bit of practice to try and understand the methodology behind this! We have no complaints about the microwave capabilities and generous size of this model, but if you’re in the market for a convection/microwave combo, you may be disappointed with the lack of power found here. The stainless steel and black design is standard, with a clear and easy to read control panel. Preset controls are available for potatoes, popcorn, frozen dinners, pizza, soften and melt – along with the usual defrost and different power settings. Operation is intuitive and simple, with no extra button pushes needed. The LG LMV1683ST 1000-watt microwave has multiple venting options. Not all kitchens are made the same, so this allows you to decide which installation works best for you. This model lacks a kitchen timer, which may be a deal breaker for some people who appreciate this handy feature. There is only a single brightness setting for the over the range lamp. You cannot turn off the turntable, which can be annoying if you want to cook using larger, square dishes. The two-speed fan is quite loud. A feature which you may find either helpful or annoying is the beep that sounds when your food is done – it lets off three long beeps every fifteen seconds until you stop it. 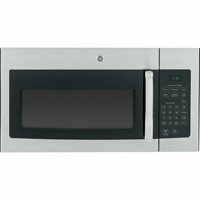 The LG LMV1683ST is a quality, standard unit which will take care of all your microwave needs – the only common complaints being lack of timer and a weak under-range light. If these things are deal-breakers, another model will be more suited to you. 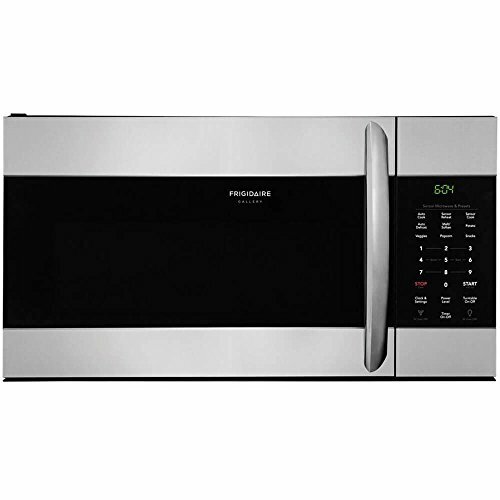 This Frigidaire model includes the features you need at an affordable price. There are one-touch buttons for 30 seconds, one, two and three-minute cook times, along with manual programming and different sensor modes. With a sleek and simple design, It is surprisingly quiet when in use, although the fan adds a little extra noise, but nothing you wouldn’t expect. The over the range LED lights are powerful and the two-speed vent fan works exceptionally well. The only complaint we have about this great appliance is the alert beep, which continues to nag loudly until you have the time to come and stop it. Overall, this is a high-performing microwave that does everything it says it will do simply and efficiently. It also comes at a great price. The GE JVM3160RFSS 1000-watt microwave is on the higher end of the power spectrum, which results in faster cooking times. However, with higher wattages, you’ll need to err on the side of caution to prevent overcooking or burning food. GE has hooked the powerful 300-CFM venting fans to a steam sensor that turns on automatically whenever you use the oven. This is nice when you need it – you save a button press by not having to manually activate it – but the fan can be quite loud and there’s no obvious way to disable this feature. The dimensions of the GE JVM3160RFSS microwave have been incorrectly published on a variety of sites. Be sure to check the actual specs on the manufacturer’s website to make sure it will fit in your kitchen. The cook time notification and the timer on this microwave use different sounds. This is quite handy when you need to time other kitchen tasks as you use the microwave since you’ll know which is which without looking. On the other hand, the panel is quite dim compared to other units. If you don’t have a well-lit kitchen, this may be a deal breaker. Looking for something to fit in with a crisp, clean kitchen style? This GE microwave is an off-white color marketed as “bisque”. It’s a budget model that won’t break the bank but does a great job for the price. Although the capacity is not quite as large as many of the appliances listed here, there is the option to turn off the turntable – so you can use larger, square dishes easily. We love the over the range light with two options – full and night mode. It’s nice and bright no matter what time of day you are busy in the kitchen. We feel the venting fans could be a little more powerful – even with two settings, they only pull a little steam, but they do an adequate job. Although the controls are easy to use and intuitive, they can be hard to see in low light – with a difficult to read, greyish text. The door of the microwave can feel a little flimsy and is quite noisy to close, although the cooking operation itself is nice and quiet. Overall, this is a great purchase for the price range. Operation is easy, the oven cooks well and the only niggles we have are things you can easily live with. Over the range microwaves can be hard-wired into your kitchen or plugged in with a standard grounded plug. If you don’t know how to hardwire an appliance or lack the confidence to tackle it on your own, contact a professional for your safety and the safety of your family and home. We do not recommend connecting a microwave to a circuit already assigned to power other appliances in your home because of the risk of overload and tripping of the circuit breaker. Over the range microwaves tend to have a larger capacity than countertop units. If you’re cooking for a large family or use your microwave for larger cooking projects, these may be an ideal buy for you. While a larger microwave doesn’t lose efficiency in the cooking process and shouldn’t substantially increase your power bill, the investment required to purchase, wire and mount an over the range microwave can be substantial if you’re not a competent home handy-man/woman. Depending on your habits and kitchen requirements, an over the range model may not be worth the money or effort, so it’s important to do some research and understand your needs. While most microwaves offer a turntable to rotate your food as it heats, many over the range microwaves also offer a convection feature so you can use your microwave as a second oven. These microwaves often include trays so you can raise food to the center of the microwave space for effective convection cooking. Convection ovens work faster than radiant heat ovens because they offer heat not only from the top and bottom but also from the back. Convection ovens also use a fan to cycle hot air to your food. This speeds up the cooking process. Convection ovens can reduce cooking times by up to 25% thanks to the efficient movement of hot air, and many home chefs find the addition of an over the range microwave with convection capability is a much-needed asset. Over the range microwaves offer venting capabilities to serve the dual function of kitchen fan and microwave. These fans come in variable speeds depending on the microwave and many offer replacement charcoal filters to keep kitchen odors in check. An electric range can pull a lot of power – bear in mind that adding an over the range microwave with venting capabilities and convection cooking will add to the power load in your kitchen. Cooking in a microwave can mean handling extremely (and sometimes surprisingly) hot containers at the end of the cooking time. With a countertop microwave, the move from microwave to counter can be quick. However, pulling a hot dish from an over the range microwave can put you at risk of burns. Spills from microwaved dishes may wind up on your hot cooktop and put you at risk of injury or fire. Because of their height, it may also be difficult to get a good look at your food while it’s cooking, requiring you to remove it mid cycle to assess. Mounting an over the range microwave takes some know-how and access to the wall studs. Over the range microwaves are generally larger than countertop models and many include vent features, thus, they are heavy. If you’re renovating your kitchen and choose an over the range microwave, be aware that replacing it may require an adjustment to your cabinets or molding. There are several different methods for dealing with sizing adjustments, including updates to upper cabinets and re-fitting crown molding. Appliance technology is always changing and improving, and cooking capabilities and size change accordingly. An over the range microwave can be a striking addition to your kitchen cabinet layout, save you some counter space and increase your cooking options. If you like to entertain or often cook for a large crowd, an over the range convection microwave can greatly increase your cooking efficiency. Our top pick over the range microwave/convection oven is the compact Sharp R1874T Over-The-Range Convection Microwave. 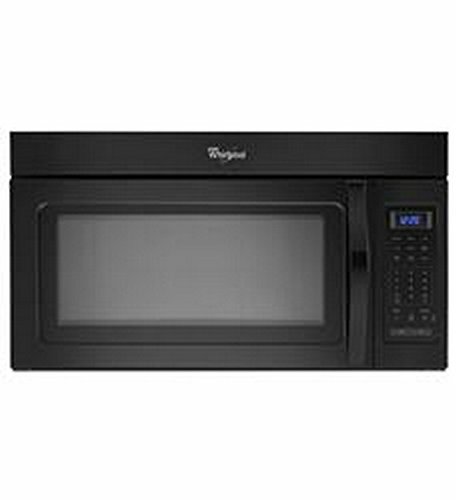 If you have no use for the convection option, we recommend the Whirlpool WMH31017FB Over-The-Range Combination Microwave Oven. It’s a generous size, with the option to turn off the turntable for oddly shaped dishes. Can You Microwave Mason Jars? Is It Safe?